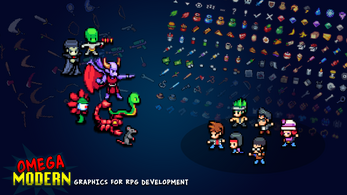 This collection includes everything you need to build a full game in a single style: characters, battlers, faces, tilesets, monsters, icons, and even system graphics. OMEGA MODERN includes over one hundred character sprites, and that isn't even counting the animals, aliens or robots. Each human character also has a face graphic, and sixteen of them have fully animated side-view battlers so they can be used as heroes. Each monster has an overworld walking sprite as well as a image to be used in side-view combat. 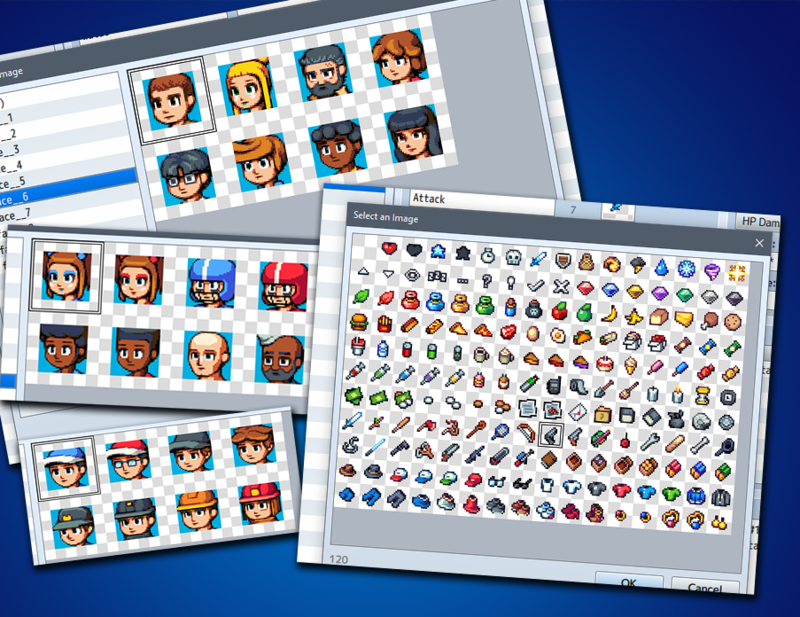 On top of that, extra character sets are included for cars, vehicles, treasure chests, switches, and special effects. 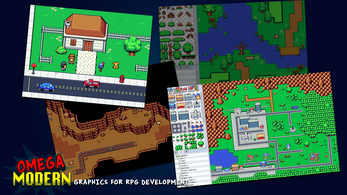 Twenty-six tilesets-- including autotiled water, terrain and buildings-- provide a variety of options for creative locations. Forests, caves, towns and cities are a given-- there's also tiles for a school, a science lab, a fast-food restaraunt, bathrooms, and more. 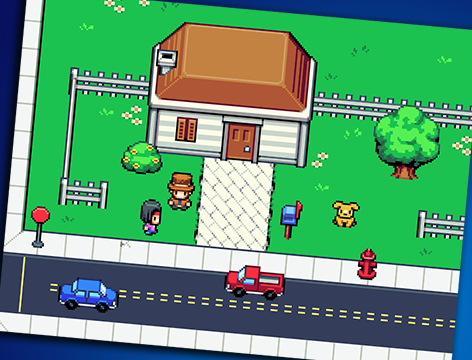 House and building tiles can be mix-and-matched for even more options in creating your game world. 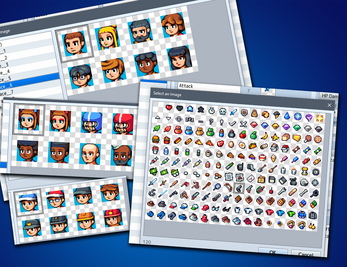 Also included: a huge set of icons for items, weapons, equipment, etc. OMEGA MODERN also has the system graphics needed to keep your game looking good with a single consistent style: emotion balloons, animated state icons, and even four different window skins. All of it is designed to work together! 26 tilesets! Interiors and exteriors-- towns, cities, forests, dungeons! System graphics to match the pixel style: emotion balloons, status icons, weapons, and window skins! what the size of the tile and characters? 16x16? 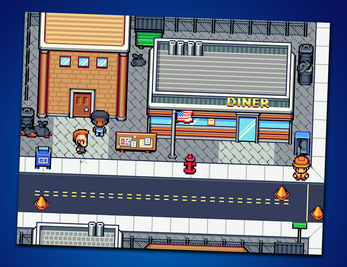 That's right, this set is based on a 16x16 pixel grid. Hi, are these compatible with the Old School modern set? Not exactly. These are made to be better than the original Old School modern, as an expanded remaster. The color palette is different and the characters are in a new style. Most of the material from the original Old School modern set is here, recreated in the new Omega style. But they do use the same base tile size, so they can work together without any problems. It just might require a little bit of editing in order for the visuals to match, mostly by color scheme. I hope that makes sense. Thanks! 1. 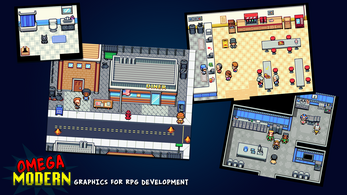 What would you recommend for battlebacks in rpgmaker with this? The enemies are relatively small so I'm assuming they're supposed to be in a line across the middle of the battles screen (assuming a front view), but I'm not quite sure if any of the default battlebacks would look good with that. 2. I don't want to make a game about kid characters, and so it's hard to tell, are the default hero ones i.e. the ones with sv_battlers adults or kids? 1. They'd work best in a side view setup; for battle backgrounds I normally make them by making maps out of the tiles and usIng that as an image. 2. I imagined them as teenagers; you can use them however you want! Ooh, that battleback sounds like a good idea. 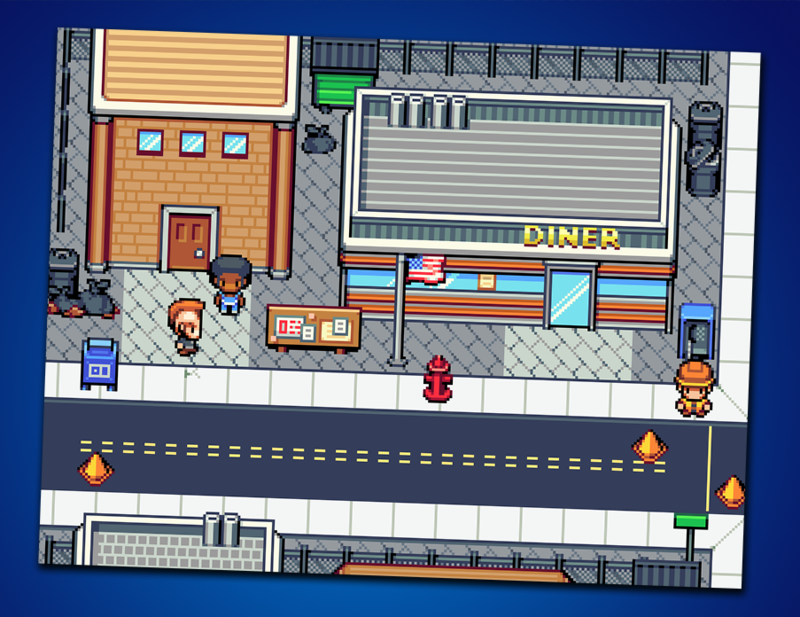 Incidentally tho I'm going front view so that all the characters can potentially be usable in combat, so I was initially thinking of the battlebacks in terms of like Earthbound or something. But yeah, some battlebacks made of key map locations sound like just the thing. If I purchase this, Can i use it for my own game that I can then put up for sale on steam? Thank you! i'll be buying this very soon! I have a sugestion. Can you change the walk sprite and can you put the sprite, battler and face set base?? Good idea. I'll probably share the base at some point in the future. Thanks! No thanks to you for answering, and another little thing, can you change the movement of the legs in the lateral sprites? Awesome job, dude! How well do you think the tileset mixes with your previous releases, like Time Fantasy? This is an entirely new style, so it's not designed to work with Time Fantasy. The only parts that would really work would be maybe the icons, or stuff like that. But don't worry, Time Fantasy is getting its own modern-themed expansion soon too! Do the animals have walking animations as well? Nice! Are the battlers online sideways and not top or bottom? Also, what actions can they perform? The hero battlers are for a Side View system. 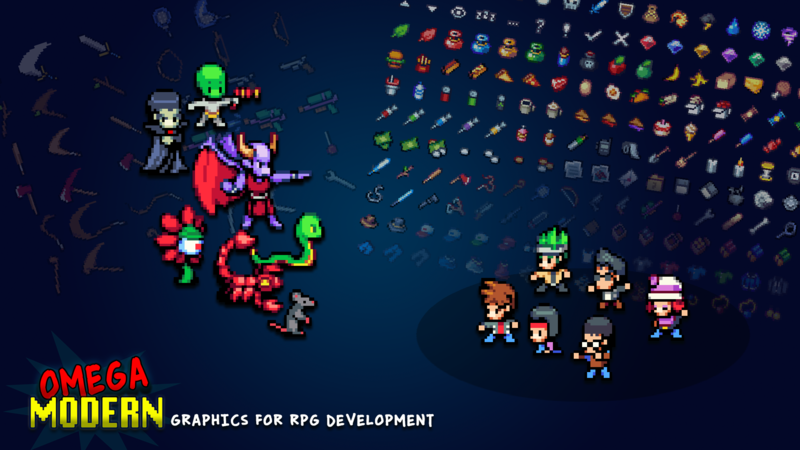 They have standard animations that would be expected for that type of rpg system- attack (with weapon), cast magic, take damage, crouch for bad status/low hp; victory dance; dead... there's also a variety of weapons that can be overlaid on the attack sprite animations. It's priced that way because of the amount of content. There's enough graphics here for an entire game! awesome! looking forward to using it! I have to agree the price is fair. Having had the privilege of being a patron of his and got this resource pack already. I can tell you whats in it is probably the single most largest resource pack I have seen!